First of all, can I just say that you all are awesome - I really appreciate all the honest feedback on my not so great look yesterday! This is why I love blogging. I can be honest and say I think this stinks and we can all agree and laugh about it. I love it. I did take one of your suggestions (Tiffany) and tied the shirt at the waist to try and survive the rest of the day. I do think it fixed the look, which is shown here below. I'm still sending this shirt on down the line though because my 65 year old boss comes back from lunch yesterday and looked at me and said, "that's a pretty colored shirt, I have one just like it!" Then she says "in fact, I almost wore it today!" I politely laughed at that statement but it has pretty much sealed the deal that this shirt is on the way out. I certainly don't want to be dressing like Betty White or something. Even though I love Betty White, I think she's the bomb and I often say I want to be her when I grow up (in other words get old) I don't want to be dressing like her - or my boss - right now! I much prefer today's outfit! I just wish the weather was better this morning, these photos aren't the greatest. I should have stuck to indoor photos, but the Pants Monkey was kind of in my way this morning (we may have both been running behind) so I thought, well at least it's not raining. But it's not very sunny! Yesterday was perfection, it was sunny and warm and lovely. I'd love it if that weather came back! I'm taking a risk on these shoes today. I triple love them, but the last time I wore them was to Easter Mass and I was standing a lot and my feet were killing me after only a couple of hours. I will have to see how an entire day will go! And I guess I'd better not enter the construction zone at work today either! That's all I got today. Just promise me you'll say something if I start dressing like Betty White again. Sing it with me now, "Thank you for being a friend. Travel down the road and back again. Your heart is true you're a pal and a confidant." I do love today's outfit! Those heels are super cute. I think tying the shirt really improved the outfit! But I don't blame you for getting rid of it after your boss made that comment. 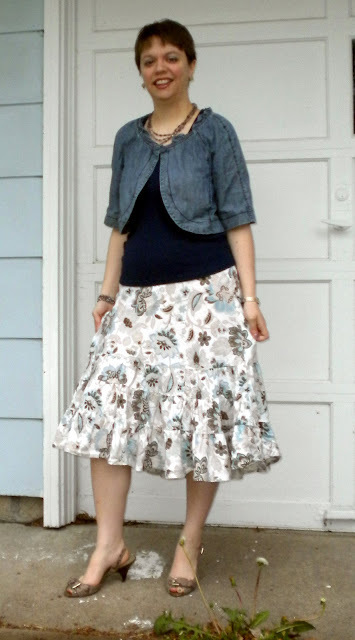 I love the floral skirt in the second outfit! It looks great with the little denim jacket. I love this tiered skirt - so cute with the layers on top. I hope the shoes work out, because they are adorable. Knotting the shirt helped, but that long mini-floral skirt is a bit dated (circa 1994, I believe). You are so cute! 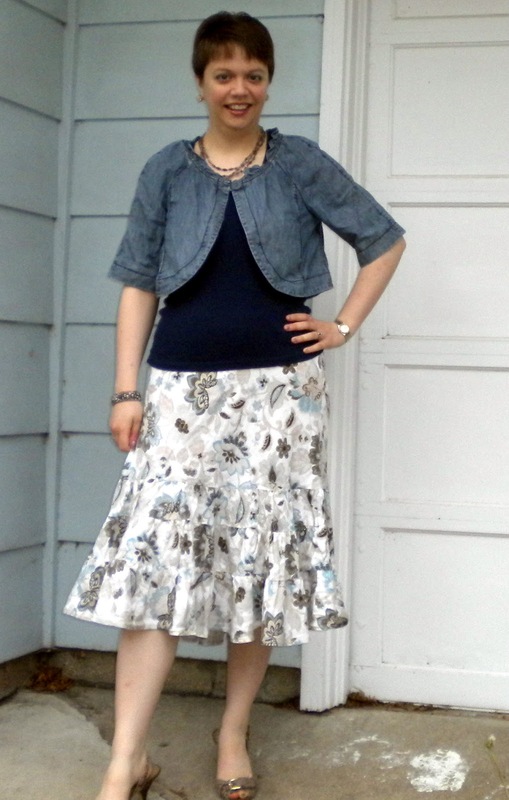 These layered outfits are really fun and pretty on you. Love that light pink too. Eep! Lol, your boss's comment. I think that would have sealed it for me too. I love your cute denim jacket! The cut is adorable. I'm always jealous of people who can pull of those tulip-y cuts. reasons, it's amazing at how differently i look at some of my outfits or certain clothing items! I've got a big thing for tucking, and higher waistlines lately, so I love how that top outfit looks! Shows off the narrowing of your waist! LOVE today's outfit. Everything's working...the colors, the pattern, the fit. As far as the pink shirt goes... I love pink and think it looks much better tied and open a bit like you show here. You could even roll up the sleeves a bit when it's warmer. And I like the idea of wearing it like that with white pants or skirt. How'd your shoes work out for all day? I know just one little rub the wrong way can be torturous after a long day. I actually loved the outfit yesterday once you tied the shirt. It gave it a whole new look and didn't look so "boxy". Love, LOVE the outfit today! !